Looking for movie tickets? 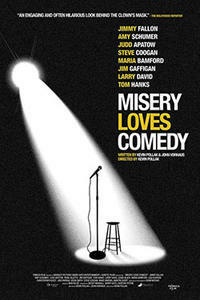 Enter your location to see which movie theaters are playing Misery Loves Comedy near you. Jimmy Fallon, Tom Hanks, Amy Schumer, Jim Gaffigan, Judd Apatow, Lisa Kudrow, Larry David, and Jon Favreau are among over 60 famous funny people featured in this hilarious twist on the age-old truth: misery loves company.